Morzine is perfectly placed in the heart of the Portes du Soleil for the ultimate mountain biking holiday in the French Alps. Book your flexible mountain bike break now! Pass’Portes du Soleil MTB show 2018. 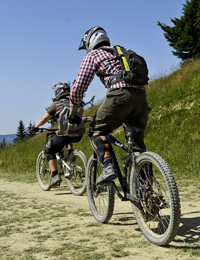 For the real MTB experience in Morzine, don’t miss the Pass’Portes du Soleil. This event launches the summer biking season where all the areas open their lifts and all resorts become open for the summer season (Les Gets, Morzine, Avoriaz, Chatel, Morgins, Le Crosets, Champery and Torgon). With a lift-assisted 50-mile free ride tour of the region, this is the perfect way to see the whole Portes du Soleil area. Refreshments in the form of local specialties are provided along the way. Morzine bikers can complete the circuit in a day or over a weekend, with massive descents, traverses, and even a little hill climbing, all sure to provide a great Morzine MTB experience. Special 4 nights Pass’portes MTB OFFER for 2018 over the Passportes Weekend. Only 350 Euros per person, Passport Entry included on the Sunday, 4 nights accommodation, 4 nights B&B and Transfer included. If you would like to take part in this event, be sure to contact us as rooms fill up fast! Extensive continental and English cooked breakfast daily. 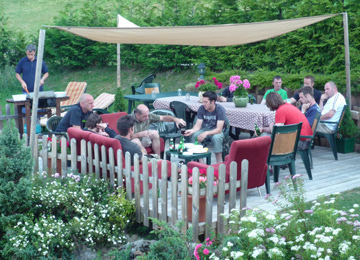 "We were 4 lads on a mountain bike holiday and everything was there for us, a drying room for bike gear, a garage to store and fix bikes, lovely rooms and a great chalet in a great location. Brilliant holiday!"